"The Walking Dead" comics are written by Robert Kirkman and produced by Image comics. The series began back in 2003 and has continued up through issue #66. The series follows a group of survivors who band together in order to survive the world over run by zombies. Where The Walking Dead is different than most zombie stories is sophistication of the characters. The Walking Dead focuses on the characters and their struggle to survive rather than the zombies and their thirst for flesh. AMC was pitched the idea by both Darabont and Gale Anne Hurd who were initially trying to setup the project at NBC. AMC's senior programming veep Joel Stillerman jumped at the opportunity for a number of reasons. 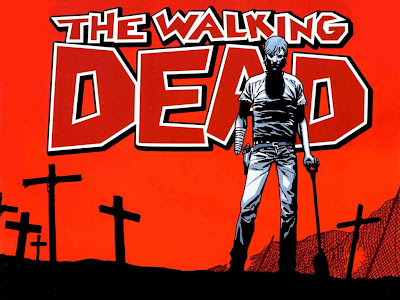 First and fore most, the quality of the source material written by Robert Kirkman. Stillerman told Variety his excited stemmed from, "the quality of the storytelling." Stillerman also knows that there is a huge fan base waiting for a series like this to come about. He said, "We've got an audience that loves this kind of material." Stillerman explained how AMC will move forward with the property. He said, "This is not about zombies popping out of closets. This is a story about survival, and the dynamics of what happens when a group is forced to survive under these circumstances."